MAMA AWETHU! follows the day-to-day lives of five black South African women in the townships around Cape Town, revealing the inhuman legacy of the apartheid system. Evelyn, once an African National Congress branch secretary, lives in a squatter location called Philippi and works as a cleaning woman. Iris, also from Philippi, is a member of the ANC Women's League who is involved in community politics. Sheila, a resident of Khayaletisha, is a committed activist; Dinah is new to politics; and Nopopi focuses on issues affecting women. As they share their lives with the camera, the film reveals how township life has necessitated their involvement in the struggle for better living conditions and equal rights. Although set in South Africa, the inspiring voices heard in MAMA AWETHU! are a call to empowerment for all women. They speak eloquently of hope in the midst of immense violence and killing. 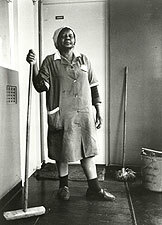 Much more than a record of South African women, MAMA AWETHU! is a song about life and the courage to live. "Over the years I have seen quite a few films about apartheid... but I have never seen anything like what MAMA AWETHU! Has been able to accomplish. "—Marc N. Weiss, Co-Executive Producer, P.O.V. Five residents of White City, a neighborhood in Soweto, were trained how to use small Hi8 cameras, so that they could tell the story of their own lives, in their own way, to represent themselves to their fellow citizens, and the world.